i will check this series out! This is really amazing, I love the theme and setting. It's beautifully composed and the texture is a great touch. I'm not sure about the text, but it's gorgeous. I just adore the colors! The background is beautiful as well! aw thats so soft and romantic! beautiful wallpaper! thanks for sharing! 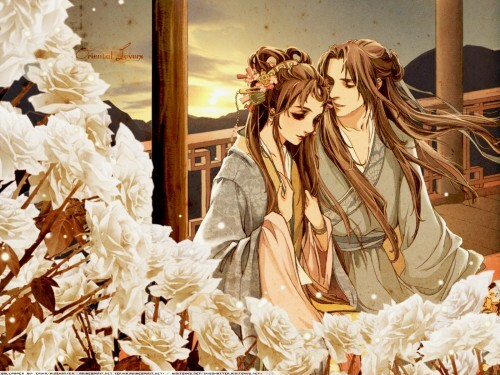 makes me remember of miaka and hotohori. ? this is so beautiful and elegant..
thx a lot for sharing it..
Wow this is a gorgeous image, one of my favourites!